Take a look at some of Lincoln's public art projects. The Lincoln Partners for Public Art Development will work with the City of Lincoln to develop a public art collection of national prominence in Lincoln, which will enrich the quality of life for Lincoln’s residents, complement the City’s exceptional educational and cultural amenities,and support a positive economic environment in the community. This program will serve to unify the community, encourage creativity, and reflect the diverse cultural heritage of Lincoln residents. All are invited to learn more about the design of Tower Square and ASCENT with the artist, Jun Kaneko. We will also have a video highlighting Jun Kaneko and hear about Lincoln Partners for Public Art Development and exciting new things coming to Lincoln. 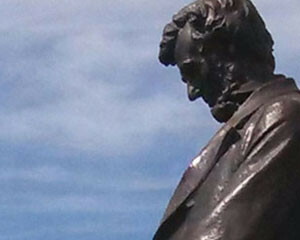 Lincoln is set apart by the community’s commitment to the arts and humanities. We are shaped by artists such as Bertram Goodhue, Willa Cather, Daniel Chester French, Philip Johnson, IM Pei and Jun Kaneko. An appreciation for the arts and how it enhances a community is in Lincoln’s DNA. of that city. Lincoln is rapidly building a fabulous collection of quality public art. It’s free. There are no tickets. You don’t have to dress up. You can view it alone or in groups. It’s open to everyone.